It’s easy to get to, too! Just take the Market-Frankford line to 2nd and Market and walk down to Columbus Blvd., or rent an Indego bike – there’s quite a few stations along Columbus Blvd. We’ve rounded up our favorite things to do along the Delaware River Waterfront this winter, but the fun continues year-round. Be sure to follow Campus Philly on Instagram for our daily updates on events and happenings all around the city, and check out our calendar for even more of our recommendations! Cherry Street Pier and Race Street Pier: an abandoned pier up until 2018, Cherry Street Pier is now a mixed-use public space with multiple local artists showcasing their work on a rotating basis (so every time you visit is a different experience! ), a market where you can buy locally made items, a beautiful garden that leads out to stellar views of the Ben Franklin Bridge, and of course, delicious eats… sold out of historic trolley cars! Race Street Pier is always bustling with activity, whether it’s running, free yoga during the spring and summertime, or just enjoying a picnic with some of the best views in the city. The Spirit of Philadelphia: after a $1 million renovation, the cruise ship (complete with an outer deck with an open-air bar, and a lounge with a beer garden) has a fresh new look and is even better than before. If you’re in charge of planning your school organization’s outings, this is the perfect venue to impress attendees for your sorority/fraternity formal, campus club party or sports team end-of-season event. 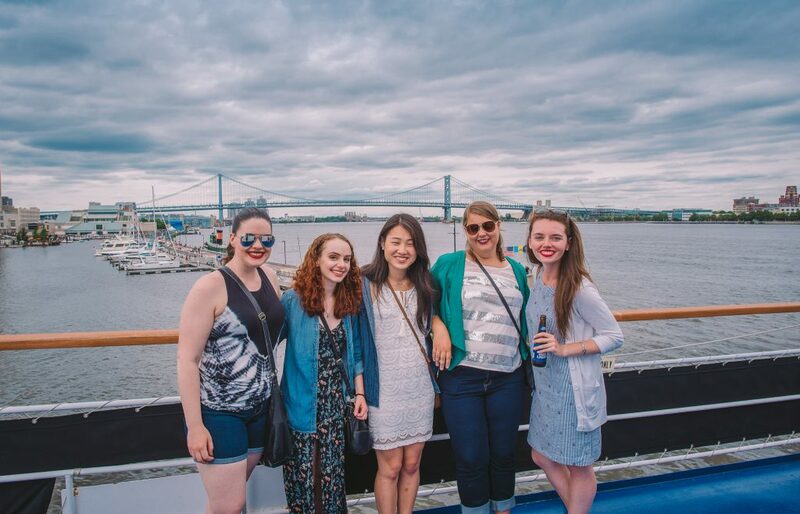 Cruises leave from Penn’s landing, and lunch, dinner, and special event experiences are all available. More information about tickets can be found here – be sure to ask about student group rates! At any time of the year, any day of the week, the Delaware River Waterfront is an awesome spot to be. Follow Campus Philly on Instagram for even more things to do on the waterfront and all over your extended college campus… the city!